These days, we seem wired to our electronics! Challenge your child to imagine a world without electricity in this creative writing prompt. She'll practise building paragraphs and using descriptive language, all while thinking critically about how dependent we are on electricity. Keep creativity alive this winter break with a creative writing prompt, inspired by the spirit of Christmas giving! Get creative with this Halloween writing exercise. Your child will write a brief paragraph on the topic provided. Think scary thoughts! Work up an appetite for writing, with a Thanksgiving creative writing prompt. Your child will use her imagination to craft the perfect Thanksgiving dinner. This creative writing prompt asks your child to imagine if humans could live underwater! 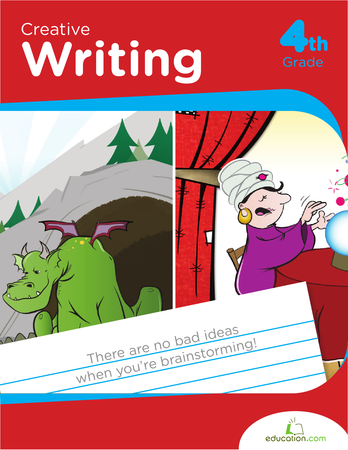 Fourth graders can practise writing and storytelling in this creative writing exercise based on a make-believe pet dinosaur! Little Easter Bunnies, get out your creative thinking caps and delve into this Easter writing prompt. Can you think up the best Easter egg hunt? Write about it in this creative writing exercise. Dive into the magic of storytelling with this diverse series of writing prompts. Enlighten the holiday spirit in your beginning writer, and have her respond to this Christmas writing prompt about the holiday colors. This Easter writing prompt will get your child to think about Easter traditions and then order his thoughts by practising structured composition. Encourage your fourth graders to put their writing skills and imagination to good use by imagining that they are opening up a restaurant and writing about it! Either way you're in trouble with this scary and thrilling creative writing prompt.